We were so excited when we gained access to images created by Walt Peregoy. It was when he was alive, and we got to speak to him and meet him on several occasions. He was truly a consummate artist, just like so many artists who were integral to the creation and development of Disneyland. Finding rare and authentic art actually used to create a film, or build an enduring world like Disneyland is one of our greatest joys. So many people online are finding and buying art created after the fact, or by fans. Many of these fans are wonderful artists, but they are still creating fan art! When we are able to offer concept art for something loved the world over, (in this case, Disneyland) it goes in our memories as yet another reason why we stick to small business and owning an art gallery. Somebody has to be the custodian of the production art! To us, there is a difference. Putting our hands on the art, knowing it was toiled over, designed in some mid-century modern office, and even better, to recognize the avant-garde design style that went on to influence 101 Dalmatians, and inspire Disney to give the designate “LEGEND” to the artist. Well, that’s the whole point of “film art by the filmmakers”. Born in 1925, Peregoy knew early he wanted to be an artist. He started taking classes at the ripe old age of nine, in Berkeley, California. Through his teenage years, he studied at Chouinard Art Institute, (where animation luminaries Chuck Jones and Frank Thomas and Ollie Johnston went, among many others) and at 17, quit school altogether to work at Disney, before abruptly leaving to fight in WWII, and then studying at arts universities after the war in Mexico and Paris. In 1951, he came back to Disney. Along with working on the designs for Disneyland, he and another artist also known for his stylized artistry, Eyvind Earle, worked on 1958’s Paul Bunyan, for which they were nominated for an Academy Award. He went on to be lead background painter on Sleeping Beauty, and became color stylist on 101 Dalmatians and The Sword and the Stone. There’s a great Disney documentary called, “Four Artists Paint One Tree”. 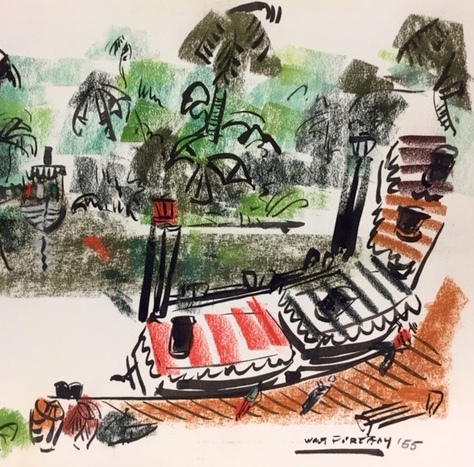 What makes it so great is the fact that four illustrators who worked at Disney and in commercial art were highlighted, Marc Davis, Eyvind Earle, Joshua Meador, and Peregoy. Walt Disney always believed the artistry required for animation and imagineering was “fine art”, and there were no qualifiers to the artists who worked at the studio. To him, they were as impressive and talented as those in museums, and he promoted that perspective as often as possible. What this documentary shows, and what I talk about all the time when people come into ArtInsights and ask about the artists represented, is that regardless of what these artists are working on, be it a character like Cruella, a background from Sleeping Beauty, or concept art for Disneyland, they are able to infuse it with their aesthetic, AND follow the guidelines required for the project. FANS OF ART AND ANIMATION SHOULD SEE THIS!! I could watch this documentary over and over. (and went down that same rabbit hole I go down every time I watch it…fascinating!) Are these artists stilted when they speak about their creations? Yes. Who cares? Seeing them paint and explain their designs is ever-fascinating. For any artists wanting to learn about how to express their own aesthetic, it’s superb. For the lucky person who buys the concept art from 1955 for Disneyland by Walt Peregoy, it just reaffirms his genius.